Step 1 Heat the oven to 400 degrees. Combine the cornmeal, flour, baking soda, baking powder and salt in a mixing bowl. Combine the buttermilk and 2 tablespoons of the oil in a large measuring cup or small bowl. Add the eggs and beat until just mixed. Pour over the dry ingredients and mix well. Add the cheese, corn, onion and sage and mix very thoroughly. Step 2 Place the remaining oil in a 9-inch square baking dish. Place in the oven and heat for 2 minutes, then remove the baking dish from the oven and swirl the oil around to coat the interior of the pan. Scrape the batter evenly into the pan. Step 3Bake 40 minutes, until crusty and browned. Let stand 5 minutes before slicing into squares with a sharp knife and lifting them out with an offset spatula; the center will be crumbly. Serve hot with butter if you like. In Recipes-list.com we have selected the most viewed recipes from category - Breads . Enjoy the best recipes specially selected for you! 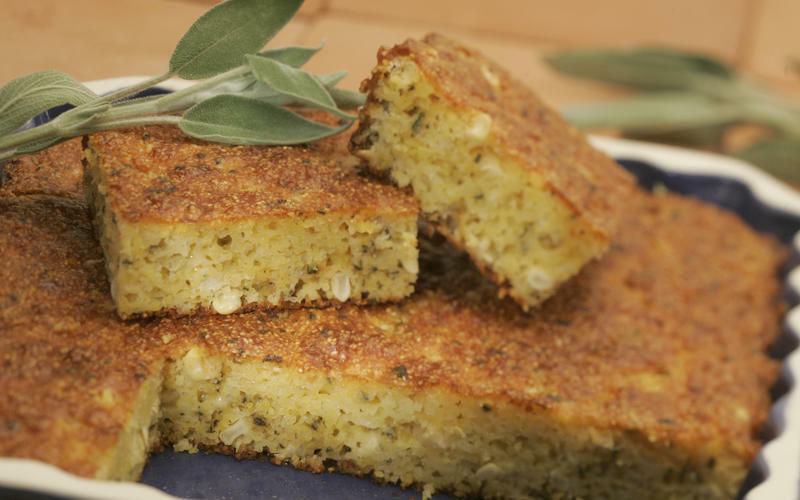 Cheddar-sage cornbread is the right choice that will satisfy all your claims.